Erin is a Legal Assistant and works with the firm’s Liquor Licensing/Hospitality Practice and also the Lobbying Compliance Practice. The liquor licensing process in New York State can be an extensive, time consuming, and sometimes baffling process. She helps clients navigate this process and assists with respect to the multitude of requirements and restrictions governing liquor licenses (and permits for beer & wine, catering permit, etc.) within the State of New York, and what information and documentation is necessary to complete the application. 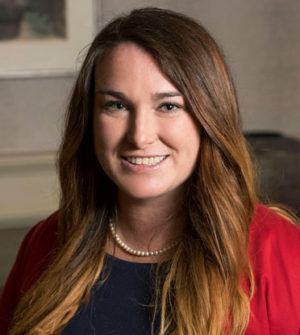 Erin also works with the Firm’s Lobby Law Compliance practice and ensures that clients are abiding by New York State’s lobby laws and the Joint Commission on Public Ethics (JCOPE) associated guidelines. Prior to working at Shenker Russo & Clark, taught Special Education and 5th grade English and History in the capital region for three years. Erin was born on Long Island and moved to the capitol region in 2004. She graduated from Shenendehowa High School in June of 2006, with an advanced regent’s degree and multiple varsity letters. Outside of the office Erin volunteers in numerous activities in the Albany area, from community clean up days to volunteering and running in 5k’s for various charities. In the past Erin has given back by helping out with Special Olympics across New York State. Erin currently plays on multiple intramural sports teams and often enjoys traveling to visit friends and family across New York State.